I was inspired to write this piece, my first for Retrospekt, after seeing some pictures of Kevin Nivek’s amazing new Space Invader and Pac Man tattoos (these will be featured in this article later). 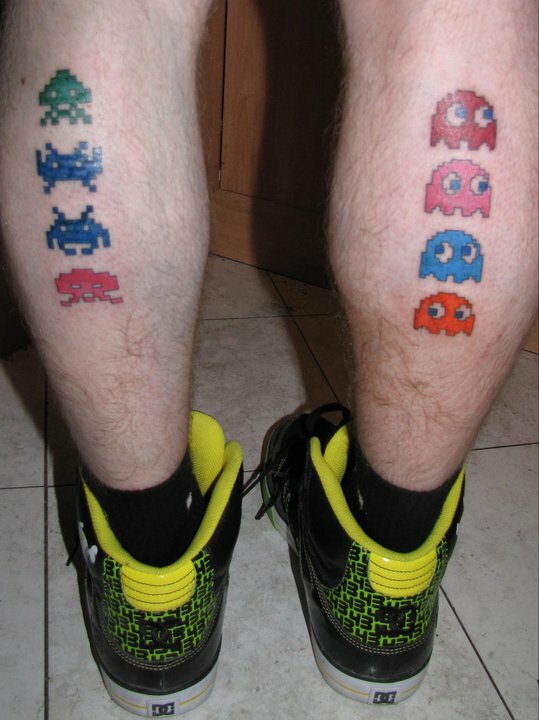 But after chatting to him about his tattoos, I discovered him to be a rich source of information about Classic Gaming! He subsequently shared the following entertaining and interesting recount of his love of, and experiences with, Classic Games. Born in Melbourne, Australia in 1968, Kevin Nivek has had a passion for gaming ever since he can remember. His family moved to Liverpool, England in 1969 where Kevin first discovered arcade video games. As a young boy growing up in Liverpool, Kevin made his own fun as he states, “There was nothing to do at home.” He therefore took every opportunity to seek out games in his neighbourhood. As he describes, “I recall spending countless hours playing Space Invaders, Pac Man, Galaxian, Galaga, Dig dug and Phoenix. Not too mention countless pinball machines.” He fondly recalls playing everything that was released at that time and took any and every opportunity to play games. He describes how, at the age of ten, he witnessed the birth of the video game as we know it, having seen and played some of the very first games to be released as arcade video games! flash, newly built dual roadhouse for petrol and some eats. And, then KAZAAM ! Kevin then moved back to Australia in 1979 . As he describes, “I was a very keen roller skater and spent lots of time at the local rink in Newcastle, and from 1980-1982 I spent lots of time playing various machines.” He then moved from Newcastle to Melbourne in September, 1982. Now 14 years of age, Kevin got a job and fondly remembers spending his entire weekly wage on a Friday night on games. Currently, Kevin owns every gaming console on the market. From the Xbox 360, PS 3, Wii, PSP, Nintendo DS, Gameboy Colour, PC, and of course his collection of retro gaming consoles like N64, PS1, PS2, SNES, Megadrive and Master System. He does not use his retro consoles to game any more as he has all his favourite old games reissued for the newer consoles. As he explains, “I have retro copies of all the oldies to play on my latest machines so Pac Man and Space Invaders still get thrashed when I don’t really want something too hard and just want some fun! difficult or boring to play? As you can see below! And what better way to pay homage to something so life-changing?